Another busy week, but Zeke and I managed to get a few rides in. Right now it’s a lot of the same – we’re working on giving to pressure, both from legs and hands. We’re getting use to riding with others in the arena. And we’re pushing through those times when Zeke thinks he should be done, or he’s bored, or he just doesn’t wanna! He’s learning that he still has to behave and pay attention, even if there’s nothing exciting going on. I will say his canter is amazing – soft and smooth and steady. Love it! The only extra thing we did this week was after our Tuesday night ride. Cindy had the trailer there because she had taken her horse Rick to the vet’s earlier, so after our ride I walked Zeke up on it, as I’m prone to do anytime I see a stray trailer. He loads perfectly – but this time I shut him in, and Cindy let me take him for a ride around the block! Fun for both of us because I don’t have much experience driving a rig, and Zeke has never ridden in a trailer other than being rounded up and run onto one! We both did very well. I didn’t hit the curbs, and Zeke rode very quietly. When I went to get him off I could feel some tension – he was just about shaking, but that’s to be expected. He backed out like a gentleman and seemed no worse for wear. Looking forward to more saddle time this coming week! Today was a really nice day. Earlier in the week, since my last weekend, we had everything from high heat to strong winds, but the last 2 days have been perfect, and Zeke and I finally got to take advantage. Due to some changes in my work schedule and feeding schedule, I wasn’t able to ride at all this week, until Friday. For the first time since we started riding, Zeke had 7 days in a row just hanging out in his stall doing nothing. I know he’s smart, but I wondered if he’d forget all the good we accomplished on our last ride. I shouldn’t have worried. I gave him a short turnout, then we saddled up and did a short lunge, then off we went. Not only did Zeke not forget, he actually improved in his responses! It was almost as though we both forgot to be awkward with our riding and just went out and did it. And today, Saturday, was even better! Today I rode for a short time in the wood arena alone, then Vickie came in to ride Slim with us. Zeke alternated between working and just being a chair while I worked with Vickie, and we had a great ride. After the arena, we all took a few laps around the pens. I think a short trail ride is in order very soon! All in all, I spent just under two hours on Zeke’s back today – the longest he’s ever been out at one time. He did great, and I’m extremely thrilled with my boy! Sometimes in order to move forward, you have to go backwards to the last thing you did really well, get solid again, and move on. Of course, that advice was for me this week, not for Zeke! Zeke kept on doing what he does, but because I I wasn’t effective at really applying my aids to correct him, we went back to the last place I felt really solid – the small roundpen. So we worked in there for a day, with me remembering to use my legs and spurs when Zeke was just blowing me off. Allowing him to ignore my leg because I simply didn’t want to pop him one led to him doing it more and more – of course! So in the small roundpen, I popped him with the spur when he needed it. And because he responded without jumping out of his skin, it gave me confidence to move on. So we made it through my weekend with some good progress – by today, Thursday, we were riding in the wood arena with confidence. Zeke is using the entire arena, from the rails to the center, and behaving nicely. Our canter has improved so that I don’t have to keep clucking and kicking to make it around – he needs a little reminder in the corner but otherwise he goes forward. We started a little leg yield work today, now that he’s moving off my leg without so much effort. It’s funny how it didn’t take much to go either way. It only took a ride or two of me being whimpy for him to take advantage, and it only took two rides to convince him that there are consequences to not responding when I ask for something. Hopefully we are back on track now for next week! After today’s work, Zeke got turned out with Frisk, and they were terribly boring. So we added Wyatt to the party, to kick up a little dust! 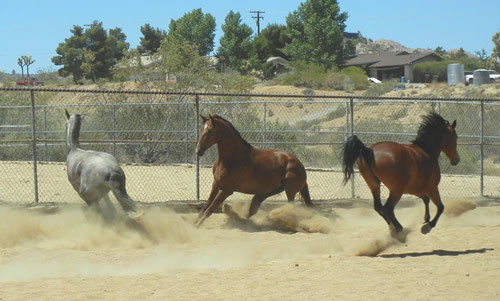 The point, for me, of doing this blog has been to show the ‘average’ person what it is like to adopt and train a mustang. Not everyone is a highly skilled and experienced horse trainer, though if you’re lucky you can have one nearby to help you during the sticky times! But many of us out here have some experience, lots of desire, limited time, jobs, families, what-have-you. I always wondered if it was possible for an ‘average’ busy horseperson to make this work. And I think it it is – but not everything is a fairy-tale. Sometimes we have to deal with our fear, so I decided not to leave that part out of this blog. Ezekiel and I ended last week really ready to step up and move on to bigger and better things. 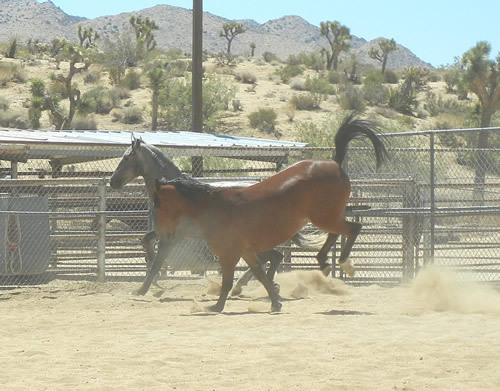 Really – Zeke has become so bored in the roundpen that he barely puts forth any effort at all to move forward! After all, if there’s no where to go, why be in a hurry to get there? We still go there first for a short warm-up and so I can canter in the smaller space, but then we head up to the wood arena. Up there, Zeke is engaged, he’s bright, he steps more quickly and looks around. He watches the other horses in the arena with us. He watches…well, so many things that he forgets I’m there! So when he sees someone standing on the ground and decides he should avoid them by bending his body away from them, turning his head to them to see what they might do, and totally blowing off his rider (me), something needs to be done. I am trying like crazy to remember to always use my leg, not the reins, to keep his body moving in the direction I’ve asked him to go. If he bulges and drifts to the right, I need to pop him with that right leg to send him back straight. But the truth is, even if I whack him hard, he’s starting to ignore me. So Cindy suggested it’s time to try a little spur or crop, to get him to be responsive to my cues. It’s like a kid who learns that his parent will tell him to go to bed six times before he really has to go – why listen the first time if you have five more chances? With a little stronger aid, he should get the point more quickly, and realize there are consequences. That’s how you teach him to respond correctly the first time. So today we tried out a little spur, because in the past I have taken the end of my reins and given him a slap when he didn’t listen to my leg – and his response was to leap out of his skin! I thought a spur might work better than a crop to wake him up without ‘upsetting’ him. Yes, I’ve begun to worry about upsetting him. That’s a bad sign. Zeke’s been so good, and we’re doing so well, that I’m falling back into that ‘don’t rock the boat’ attitude. If I don’t push him, we’ll never have a bad incident. Of course, we’ll never accomplish anything either! 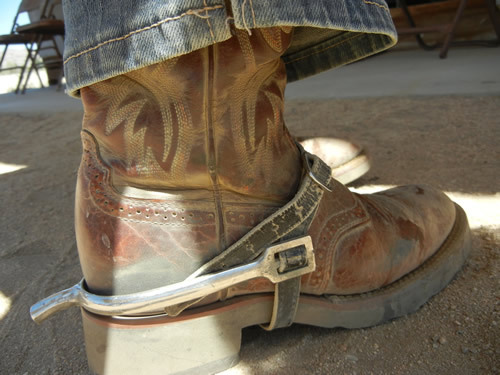 So I donned my tiny spurs, and down to the roundpen we went to gauge his reaction to them. It wasn’t pretty. We bopped along slowly as normal, and then I asked him to turn and move off my leg. He ignored me, so I popped him a little harder (let’s face it, I was afraid to get him with the spur, so I gave him another chance!). When he blew me off, I took that tiny spur and gave him a poke. Wee! He turned real fast then! He also jumped forward and kicked out with both hind legs, then proceeded to try to run off while I held him to a small circle until he relaxed. Then we continued on with our work, and wonder of wonders, he did well! He even cantered around the roundpen several times without my having to flap my legs and kiss at him over and over. So we moved up to the wood arena. As soon as we got there, I realized Cindy was working a young horse in the small roundpen next to us. For the work she was doing, it was necessary for her to crack the lunge whip. Often. So we ended up in yet another tizzy. I can’t blame Zeke for this, because up until I got on, I had asked him to MOVE every time he heard the whip. I also asked him to pay attention to the person standing in the center of the arena, which explains why he avoids people standing around. 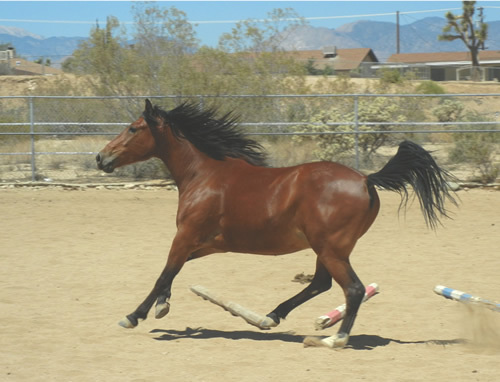 There’s no reason to think that once you’ve trained these behaviors, the horse will just know you don’t want him to respond to them anymore, because you’re on his back. It’s the rider’s job to convince him of that fact, and today I fell way short! I have to admit I just wanted to leave that arena as soon as we got there. I knew I shouldn’t, so I tried to keep riding, but every crack of the whip sent Zeke to a bolt that I had to pull him around into a little circle to stop. My job was to let him see that he didn’t have to listen or fear anything that was happening outside of our little bubble, that any reaction he had would just be ended and our work resumed. Instead, I let that fear creep into my head. What if I can’t stop him? What if he keeps running, all the way back to his herd in Ridgecrest? What if he bucks all the way around the arena? Basically, what if I lose control and get hurt? Yeah, it was a tough day for me. I had to keep going, because Cindy heard me say I wanted to leave and she brought up the point that he would never learn not to leave, and to listen to me and ignore the world if we didn’t start now. So I spent more time than I’d like to snatching at my reins, leaning forward and riding like a scared child, basically. Luckily, these little mustangs are pretty forgiving. We worked through it, and I finally relaxed, and today we did our first canter in the wood arena. And I’m determined to go back tomorrow and do a better job of being the fearless leader, so he can become my fearless steed.